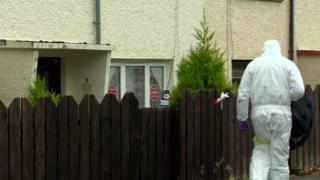 A 30-year-old man has appeared in court charged with the attempted murder of a woman in Downpatrick, County Down. The victim was critically injured in an attack at a house in Thomas Russell Park in the town last week. The accused, Michael O'Connor, did not speak throughout the hearing at Belfast Magistrates' Court, but he nodded to confirm he understood the charge. There was no bail application and he was remanded in custody to appear again by videolink on 29 December. The court was told Mr O'Connor, of Westrock Grove, Belfast, was arrested on Thursday night on suspicion of attempting to murder the victim, but no details of the attack were revealed. A detective constable said police could connect him to the charge. It is understood the woman has been living in the house with her young child for a number of years.